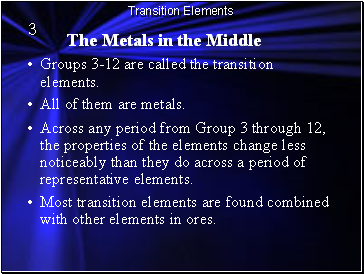 Groups 3-12 are called the transition elements. All of them are metals. Across any period from Group 3 through 12, the properties of the elements change less noticeably than they do across a period of representative elements. 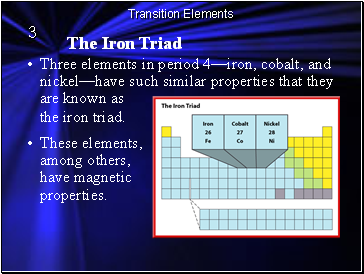 Most transition elements are found combined with other elements in ores. These elements, among others, have magnetic properties. Industrial magnets are made from an alloy of nickel, cobalt, and aluminum. Nickel is used in batteries along with cadmium. Iron is a necessary part of hemoglobin, the substance that transports oxygen in the blood. 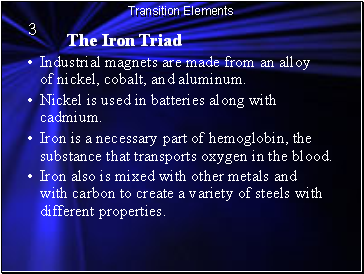 Iron also is mixed with other metals and with carbon to create a variety of steels with different properties. 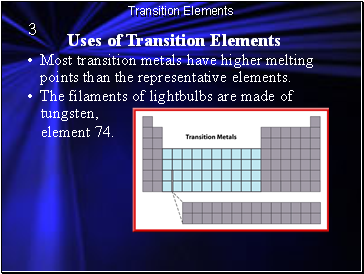 Most transition metals have higher melting points than the representative elements. Tungsten has the highest melting point of any metal (3,410°C) and will not melt when a current passes through it. 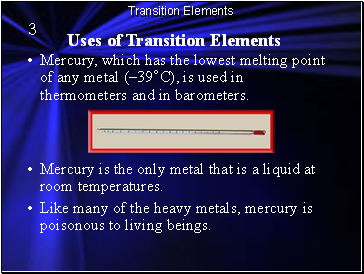 Mercury, which has the lowest melting point of any metal (–39°C), is used in thermometers and in barometers. Mercury is the only metal that is a liquid at room temperatures. Like many of the heavy metals, mercury is poisonous to living beings. 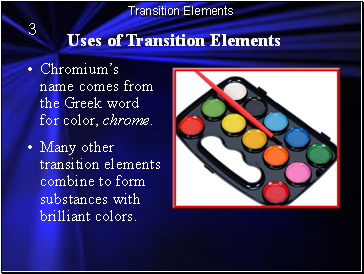 Chromium’s name comes from the Greek word for color, chrome. 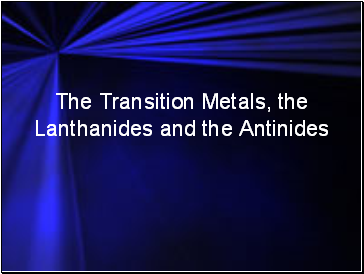 Many other transition elements combine to form substances with brilliant colors. 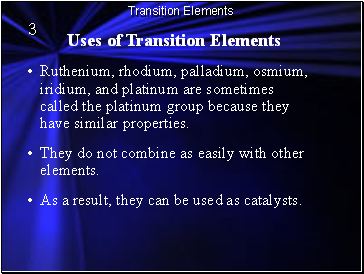 Ruthenium, rhodium, palladium, osmium, iridium, and platinum are sometimes called the platinum group because they have similar properties. They do not combine as easily with other elements. As a result, they can be used as catalysts.